We all love “The Sound of Music.” We all likely can sing the entire score if we were asked to. But did you ever wonder what life is like off camera while Maria and the von Trapp brats were singing? That’s the premise of Andrew Bergh’s ambitious The Radicalization of Rolfe. Paralleling the action of “The Sound of Music,” Bergh’s play follows young, impressionable Rolfe Gruber, the object of Liesl von Trapp’s affection, as he comes of a certain age while going in and out of the closet. It also shows the art of manipulation in a time of constant fear and uncertainty. We learn that Rolfe, alongside the von Trapp family butler Franz, is being controlled by a man named Zeller to gather intel on Captain von Trapp. 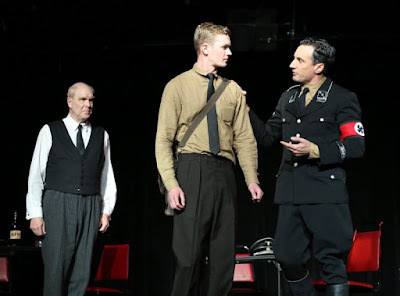 Meanwhile, Rolfe is learning about himself through the intimacy of a young man named Johan Scmidt, the nephew of Frau Scmidt, the von Trapp family housekeeper. Call it “The Sound of Music” version of Clybourne Park. Though that may be giving Bergh a little too much credit. No matter what, The Radicalization of Rolfe is an interesting angle of a lesser-shared narrative utilizing a well-known story. But it completely confuses the tone. “The Sound of Music” is light and frothy. Yes, the backdrop is dark but that’s not what audiences remember. Bergh’s play gets tonal confused as the only moments people laugh are through the well-timed references to the score. If we’re supposed to find light in the situation, Bergh truly needs to go further with the humor. As it stands now, laughing at anything else is near impossible. A reason for the lack of comedy could be that the play was painstaking too slow. Director Abigail Zealey Bess absolutely needed to bring a metronome into rehearsal and make her company pick up the tempo. Zealey Bess smartly moved from scene to scene without a large scenic shift. It also meant that we were forced to stare at those awful chairs for the entirety of the show. The black chairs with red cushions were the right color scheme but the specific chairs looked sad. The costumes from Audrey Naman were just right. They honored the history of the time. Sometimes casting is everything. In the titular role, Logan Sutherland was picture perfect. With sunny naivety mixed with undeniable confidence, Sutherlands’ play on morality was exquisite. The breaths leading into Rolfe’s big decision were heartbreaking. If ever there was a performance to put him on the map, this was it. Logan Sutherland is a name to remember. Dominic Comperatore had crippling cruelty as Zeller. There was a seduction in Comperatore’s words. Jay Patterson as Franz balanced the character well, though a bit more animosity and resentment for younger superior would have raised the stakes. The Radicalization of Rolfe is a brilliant concept that wasn’t as well executed as it needed to be. No matter what, there’s no way to stop it. We won’t be saying good bye or farewell to this play anytime soon.